Good morning all of you super cool first grade teachers! As promised last week, today I’m sharing some very cute and fun First Grade Sight Word Caterpillar cards for you! Second and Third Grade Sight Word cards are coming soon! Oooh! Those are super cute! Thanks for sharing. You are TRULY a gift to new homeschoolers and I just want to thank you for offering so much knowledge. I literally print stuff from you every single night and plan to use your Curr next year! Thank you so much for all of your wonderful home school creations and thank you for sharing. I am a grandmother home schooling my just turned 7 year old granddaughter. We began our home school journey the last day of this last February. It was a very quick decision and I have been kind of feeling my way through the process. I really love the cute little caterpillar sight words. Your creations are so clever. You are very gifted. I think God I found your site. Thank you so much Erica! Your website has been a blessing to me as I venture into my first year homeschooling my 1st grade triplet boys! I love everything that I have seen so far and have already prepared to use several of your amazing creations! 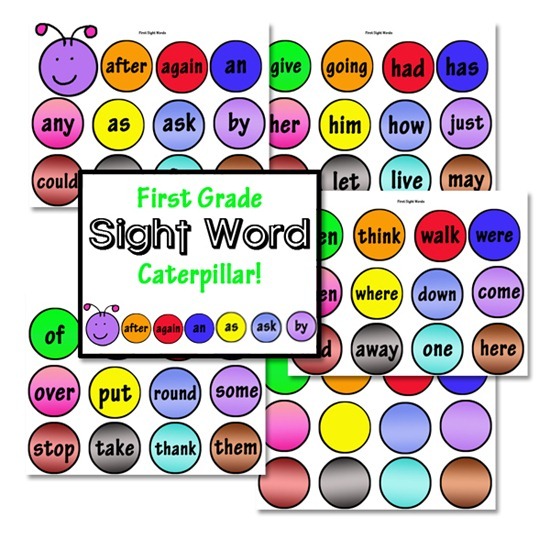 We will be doing the ‘daily learning notebook’ for calendar to start our morning and I plan on using the 1st grade sight words sentence worksheets as well as the super cute and colorful caterpillar! Thank you for getting our new classroom off to great start! I cannot wait to purchase your RoadTrip USA and Expedition Earth later this year! One of my sons absolutely thrives on geography and history. When I realized that we had picked MUS and you are also using, I really felt good about our choice! 😉 Hope your move is going smoothly and I’m sure you will see me around. Thank you for providing these worksheets. They are excellent and have been very beneficial to us. My daughter has learnt a great deal because of the resources you have provide. God bless. Thank you so much!!! Printing first grade cards was on my todo list today. My daughter will enjoy these- thanks again! !